One of life’s great pleasures when we moved to Connecticut was growing things. The first 34 years of my life were spent in apartments. Having my own soil was a novel concept. Here in California we have a very limited space, but amazing growing conditions. If it can’t grow here, it can’t grow. In fact overzealous plant growth is an actual problem here. Things blossom, bloom and reach for the sky, quickly. I need my plants short and compact. The first time you cut back a healthy plant to within an inch of its life you shudder. No one wants to kill a plant. But my results have been consistently rewarding. Every plant I’ve chopped has flourished. Bushes I cut back last year had become leggy. My friend and plant expert Dennis Westler explained the higher growth was shading the lower. Today they’re closer to the ground and fuller. Instead of concentrating growth in increasingly thinner branches the trunk has added girth. It looks stronger. Plum tree today looking just a little shorter and bare. In some cases it looks a little scary. 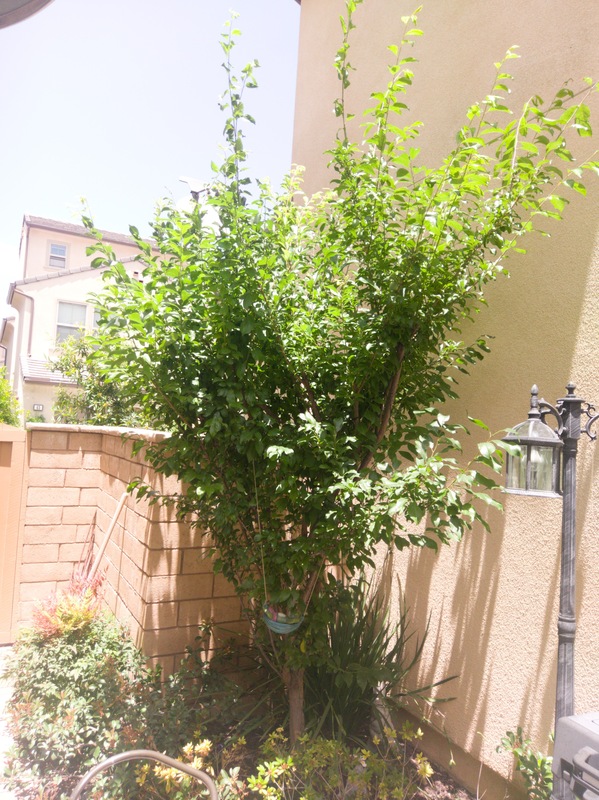 This is the second time I’ve cut my plum tree to this height. Actually Stefanie did this cutting, lopping off a good four or five feet a few weeks ago. 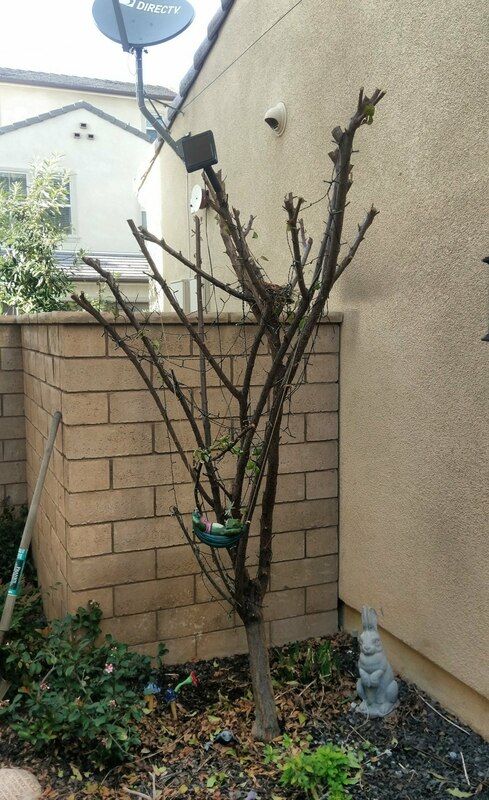 Today I removed all the suckers, the thin branches coming off the main stem. It looks very sad. It shouldn’t have any trouble coming back. There will still be some worrying. We’ve harvested five astoundingly tasty plums from this tree–four this past summer. I’m hoping for more. My mom was a merciless pruner. I don’t know how many times I’d stare, jaw-dropped, what-have-you-done – only to see strong, healthy growth right behind. She was amazing. Most folks don’t realize you should prune regularly to keep the plant healthy, not to shape it. What’s most important are the roots. If they are stressed (not enough space, too little or too much water, sterile soil, etc) the plant will struggle regardless. Think of it like algebra: if the plant has X amount of healthy roots, it provides X amount of energy. When you cut it back, its still getting X amount of energy that has to go somewhere. In Jeff’s case, because of limited exposure, the plant will chase the sunlight… which means all the top branches will extend as far as they can while the lower branches will hardly grow because the plant has delegated the energy where it thinks it should go. By cutting back and opening the canopy, more light gets to the bottom; since some of the energy is no longer needed above, it begins to fill out down below. The plant becomes healthier because the energy spreads out consistently… you don’t end up with ‘”leggy” tops and barren bottoms. And since the fruit will grow where it can get the best sunlight, it should be within reach, making it easier to care for. This is why many hedges become bare at the bottom if not getting full direct sunlight, especially if the top is wider than the base. In not good at plants, but when you get a few plums that’s good! Each year there should be a couple more, at least that’s what I would think.